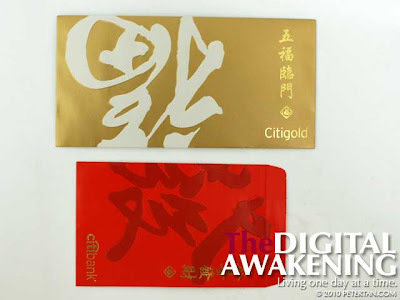 Citibank and HSBC ang pao – red envelope for the Year of the Tiger 2010. In the olden days, ang pao were actually coins wrapped in red paper – the kind that leaves red stain on the finger tips when touched. I did receive a few of such ang pao when I was a kid. Those were given by the amah chehs – unmarried servants – who usually wore white top and black bottom sam foos. I still do not know the reasons why they gave out ang pao as unmarried adults are not obliged to do that. With the easy availability of pre-made red envelopes, there is no need to get the fingers stained nowadays on the eve of Chinese New Year. 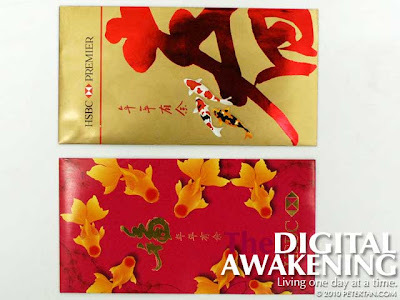 That is usually the time when married adults prepare the ang pao by putting money into the red envelopes. The amount put in must be even. Odd amounts are considered inauspicious.